If you are searching for an easier method to get some Option ROM or EFI modules of an AMI UEFI BIOS updated, you may look into >this< thread. For all users of a Desktop system with an AMI Aptio UEFI BIOS I recommend to use >this< guide and let the UBU tool do the work. This is the easiest and safest method for users, who just want to update one or more Option ROM or EFI modules, which are needed for a proper function of the onboard Device Controllers. 1. Like the tool name already indicates, the UEFI BIOS Updater can only update an already present LEGACY or EFI BIOS module, but neither extract any BIOS module norinsert an absolute new one into the BIOS. 2. Not all BIOS modules can be updated by the UBU tool. 3. Although the UBU tool offers different well-approved versions of the most popular LEGACY and EFI BIOS modules, it cannot satisfy all the wishes user may have regarding an exotic or brandnew BIOS module version. That is why I have written this guide. 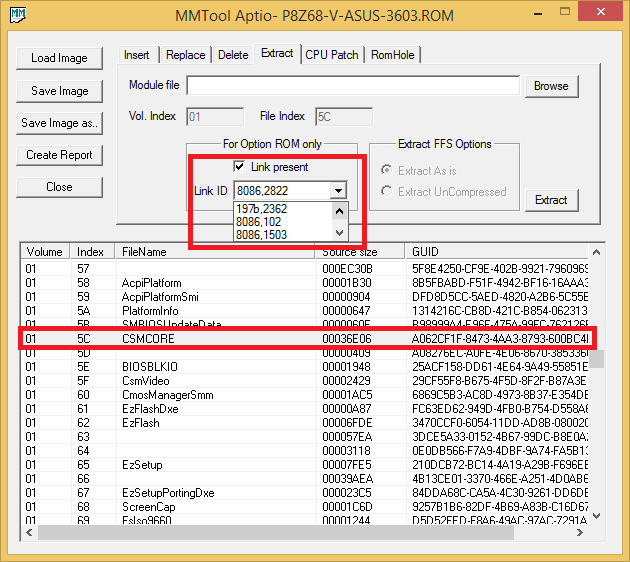 An appropriate BIOS modding tool named AMI Aptio UEFI MMTool. The link to this tool has been removed here upon demand of American Megatrends Inc. (AMI), but you may find it, if you do a Google search for "MMTool Aptio 4.50.0023". This UEFI MMTool version is recommended for the manual BIOS modding of AMI Aptio IV BIOSes (all AMI UEFI BIOSes up to except from Intel X99 mainboards). The link to this tool has been removed here upon demand of American Megatrends Inc (AMI), but you may find it, if you do a Google search for "MMTool Aptio 5.00.0007". 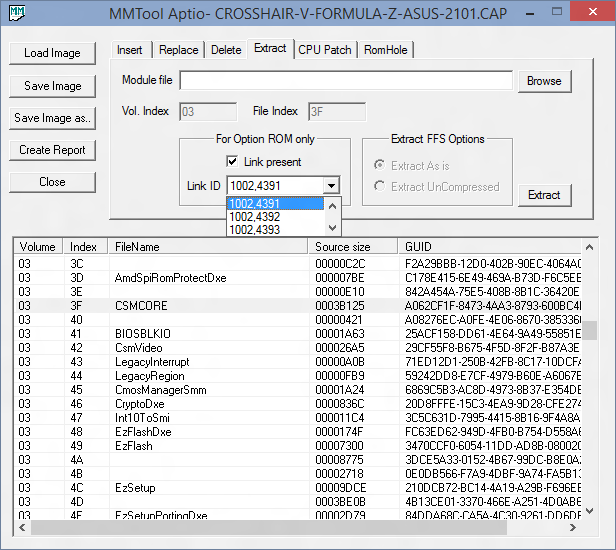 The MMTool v5.0.0.7 has been primarily been designed for Aptio V platform BIOSes (from X99 and 100-Series Chipset mainboards up). 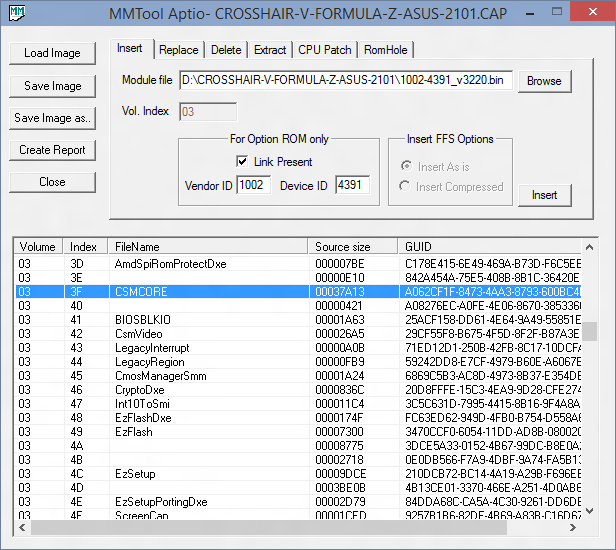 It works with not capsuled Aptio IV BIOSes as well (exception: CPU Microcode updates), but the MMTool v4.50 seems to be the better option for them. The link to this tool has been removed here upon demand of American Megatrends Inc. (AMI), but you may find it, if you do a Google search for "MMTool Aptio 5.02.0024". This is the currently latest AMI UEFI MMTool version. The original tool is only usable with AMI Aptio V BIOSes, but it exists a "patched" variant of it, which works with nearly all AMI Aptio IV BIOSes as well. Usrs, who want to use this modded variant, should do a Google search for "MMTool Aptio 5.02.0024 Mod". The "clean" (uncompressed) BIOS file you want to modify. If the BIOS has been offered inclusive installer and Flash Utility (as EXE file, it has to be extracted by using an appropriate tool. a currently empty sub-folder named "extracted", where you can put the extracted BIOS modules later on during/after your BIOS processing work. The UEFI type AMI BIOS files can easily be identified by their big size (minimum: 4 MB, usually ca. 8 MB). 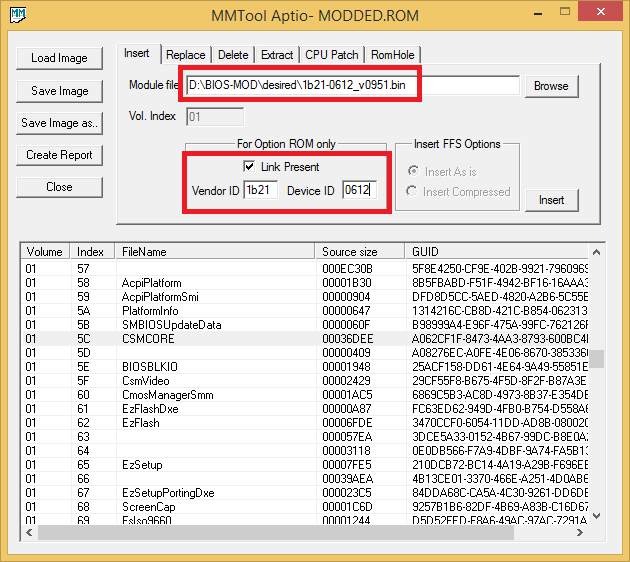 Run the AMI Aptio UEFI MMTool v4.50.0.23 named MMTool.exe as Administrator. Hit the "Load Image" button, browse to the folder with the AMI UEFI BIOS file you want to open and choose the correct "Files of Type". If your BIOS has neither the extension .ROM nor .CAP, choose the "all files" option. Now you should see the prepared "clean" BIOS file. Doubleclick onto the BIOS file. If the Aptio UEFI MMTool should not able to open the AMI BIOS file, it is not an AMI UEFI BIOS. In this case you have to use the AMI MMTool v3.26 and to follow the instructions you will find >here<. The extration procedure depends on the sort of the BIOS module you want to get extracted. So-called "Option ROM" modules, which are managing certain on-board Controllers (e.g. Intel RAID or LAN ones) while running in LEGACY mode, need to be extracted, replaced and inserted another way than EFI modules and other (non-Option ROM) BIOS modules. Below you will find the specific guides for both sorts of BIOS modules. Contrary to the non-UEFI AMI BIOS the important "Option ROM" modules of the AMI UEFI BIOS files are hidden and cannot be seen by opening the BIOS file. Usually all OROM files are stored within the BIOS file named "CSMCORE" and identified by the listed Vendor- and Device-ID. The extraction of a BIOS module doesn't effect the mainboard BIOS. It will stay untouched by the extraction. It is impossible to verify the version of any BIOS module as long as it is part of the BIOS file. So you have to extract it, if you want to know the details about it (vendor, sort, version and supported DeviceID). Run the Aptio MMTool and open the mainboard BIOS file (see above). Check the "Link present" option within the "For Option ROM only" section of the MMTool GUI. The first 4 characters (numbers or letters) belong to the VendorID (VEN_XXXX), whereas the second 4 characters (numbers or letters) identifies the DeviceID (DEV_XXXX) of the related on-board Controller (Note: If you see just 3 characters, the first one is "0" and will not be shown by the MMTool). Note: Please remember, that the Vendor and Device IDs shown by the Aptio MMTool have been edited by the mainboard manufacturer and may not be correct, but this doesn't have any effect on the function of the related Option ROM module. The Intel RAID ROM of many Z77 mainboards is shown by the MMTool as "8086, 282a", although the correct DeviceID of the on-board Intel SATA RAID Controller is DEV_2822. Some Option ROM modules are listed by the MMTool with the Link ID "1002, 55aa", although a DeviceID DEV_55aa doesnt exist. It may be an AMD AHCI ROM for DEV_4391. The digits "55aa" don't mean any DeviceID, but are just the hex codes of the first 2 bytes of the related OROM module. Hit the "Browse" button and search for the folder, where you want to store the extracted Option ROM BIOS module (e.g. D:\BIOS-MOD\extracted), choose any file name with the suffix .BIN (example: RAID_ROM.BIN) and hit "Store". Hit the "Extract" button of the Aptio MMTool. Now you will find the extracted Intel RAID ROM module as .BIN file within your test folder (D:\BIOS-MOD\extracted). If you want to know the version of the extracted Option ROM module, you should open it with a Hex Editor. Usually the ROM version is visible within the text code (right-hand side of the Hex Editor GUI). Since the "Extraction" procedure doesn't change the BIOS file at all, you can close the MMTool without hitting the "Save Image" button. Run the Aptio MMTool and open the mainboard BIOS file. Scroll down within the Aptio MMTool GUI window and search for the module you want to get extracted. Important is the listed "FileName" and maybe additionally the first characters of the listed "GUID". Make sure, that the "Link present" box within the "For Option ROM only" area is unchecked. Within the "Extract FFS Options" area choose the option "Extract UnCompressed" (this option will give you later the opportunity to open the extracted file with an Hex Editor and to verify the version and other module details). Hit the "Browse" button and search for the folder, where you want to store the extracted module (e.g. D:\BIOS-MOD\extracted), choose any file name with the suffix .FFS (example: RaidDriver.ffs) and hit "Store". Now you will find the extracted BIOS module as .FFS file within your test folder (e.g. D:\BIOS-MOD\extracted). 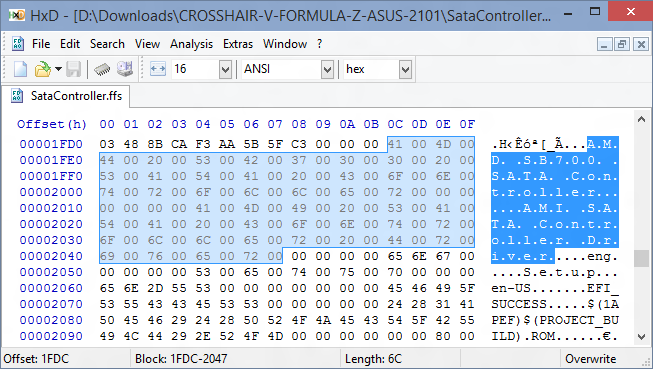 If you want to know the version or other details of the extracted module, you should open it with a Hex Editor. Usually a lot of such informations are visible within the text code (right-hand side of the Hex Editor GUI). Caution: The manual replacement of an Option ROM module is usually very safe (provided, that the DeviceID is matching), but may be dangerous regarding the Intel VGA ROM (VBIOS) modules. Users, who want to replace any VGA ROM (VBIOS) module, should read >this< guide written by SoniX, before they start their work. Open the BIOS file and hit the "Replace" tab of the Aptio MMTool. Highlight the line containing the Option ROM module you want to replace (it is usually the line with the CSMCORE file). Go to the "For Option ROM only" section, check the "Link Present" option and scroll down to the correct VendorID (8086 = Intel) and DeviceID (Example: 2822 = "Intel(R) Desktop/Workstation/Server Express Chipset SATA RAID Controller") of your on-board RAID Controller. Hit the "Browse" button and navigate to the Option ROM module (named xxxx.BIN) you want to get inserted and double-click onto it. The "For Option ROM only" section only shows the VendorID and DeviceID of the RAID ROM Modul, which has been inserted by the manufacturer of the original AMI UEFI mainboard BIOS file. So you will get no information regarding the VendorID and DeviceID of the RAID ROM file you are going to insert now by doing the replacement. Hit "Save Image" or - if you want to rename the BIOS file - the "Save Image as ..." button. Wait some seconds, before you close the MMTool. After having done all that correctly, you will find the modified BIOS within the folder where the original BIOS file was (e.g. D:\BIOS-MOD) or within the folder you had chosen while saving the modified one. The "modded" BIOS file should have exactly the same size as the original one, but a different date. If you should get an "Error in Replacing File" message while trying to replace a RAID ROM module, the mainboard manufacturer may have inserted the related special RAID ROM module twice (by mistake), but with different DeviceID's. Solution: Remove one of the identical PCI ROM modules (example: 8086,2822) by using the MMTool "Delete" tab and then retry the replacement of the other one (example: 8086,282a). Scroll down within the Aptio MMTool GUI window and search for the module you want to get replaced. Important is the listed "FileName" and maybe additionally the first characters of the listed "GUID". Hit the "Browse" button and navigate to the folder, where you have stored the desired unzipped BIOS module file (usually named xyz.FFS). Double-click onto the desired file, which shall replace the actually present one. Hit the "Replace" button of the Aptio MMTool. Some mainboards have an on-board AHCI or LAN Controller, but the original BIOS doesn't contain any suitable OROM module for this device (example: ASMedia 106x AHCI Controller). Check the VendorID and DeviceID of the Controller, whose OROM you want to insert. You can do it from withn the Device Manager by doing a right click onto the related Controller > "Properties" > "Details" > "Property" > "HardwareIDs". 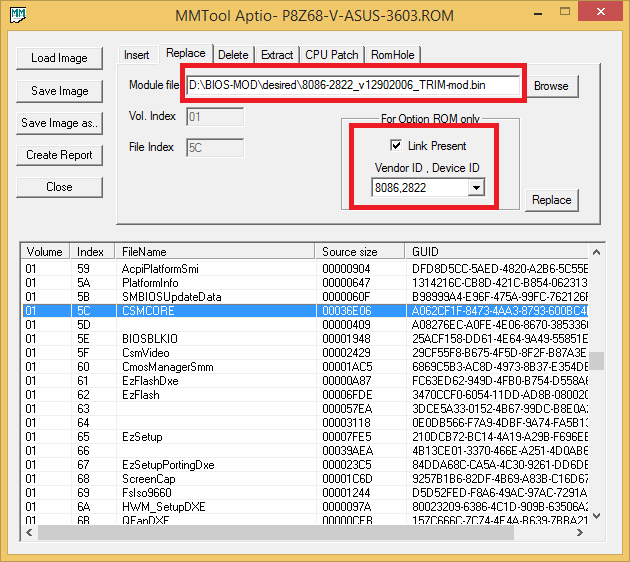 Open the original or already modified BIOS with the AMI Aptio MMTool. Highlight the line with the CSMCORE file. Check the "Link Present" within the "For Option ROM only" section. Enter the VendorID and the DeviceID into the related fields. Hit the "Browse" button and navigate to the OROM file you want to insert (e.g. D:\BIOS-MOD\desired\1b21-0612_v951.bin). Open the BIOS with the AMI Aptio MMTool and hit the "Insert" tab. Scroll down within the AMI Aptio GUI window to the line, where the module named "CSMCORE" is listed, and keep in mind the related "Volume" number of it (leftmost column). Usually it is "01". Enter the just found "Volume" number of the CSMCORE file (mostly "01") into the "Vol. Index" box (don't enter any "Index" number, just the "Volume" one). Hit the "Browse" button and navigate into the folder, where you have stored the desired unzipped BIOS module (usually named xyz.FFS). Within the "Insert FFS Options" choose the appropriate option (usually it is "Insert compressed"). Hit the "Insert" button of the Aptio MMTool. Now the freshly inserted module should be listed by the AMI MMTool GUI as last module with the same Volume number as the CSMCORE file. Although it may not really be necessary, it is a good idea especially for BIOS modding beginners to verify the successful modification before they are going to flash the modded BIOS into the mainboard BIOS chip. Run the AMI Aptio UEFI MMTool and open the freshly modded BIOS. Extract all BIOS modules, which have been recently put into the BIOS (no matter if done by a replacement or just by an insertion). Compare the size and - if similar - the content of the extracted modules with the modules, which are within the "desired" folder. If you are still unsure, open the extracted Option ROM files with an Hex Editor like HxD and look for the version number or GUID header. If it is identical to the one you had inserted, everything should be fine. For users, who want to modify an AMI Aptio V UEFI BIOS, I recommend to use the AMI Aptio MMTool v5.2.0.24 (original or modded variant). A very good alternative is CodeRush's UEFI Tool (>LINK<). By the way: The UEFITool can be used the same way with AMI Aptio IV UEFI BIOSes. Download the latest version of CodeRush's UEFITool from >here< and unzip the *.zip archive. Run the UEFITool.exe file and open the previously extracted BIOS file you want to modify. Details: Click onto "File" > "Open Image file..." and navigate to the extracted BIOS file, depending on the extension of the BIOS file you may have to choose the file option "All files (*)". If you do not yet see the folder "BIOS Region", expand the shown folders until you get it. Expand the folder "BIOS Region" and search for the name resp. the first GUID characters of the module you want to replace (the UEFITool has a very good search feature). Maybe you have to expand the shown GUID mode files incl. their subfolders to see all of them). After having found the module with the correct GUID, expand all its subfolders until you see the "PE32 image section" of the related file. Right click onto the "PE32 image section". Choose the "Replace body..." option of the UEFITool. Navigate to the "pure" EFI module (with the extension .efi) you want to get inserted (maybe you have to customize the file model option to "All files..."). Now the UEFITool will do the replacement. Save the modded BIOS image (clck onto "File" > "Save image file..." and give the modded BIOS a meaningful name). Verify the success of your work by opening the BIOS with the appropriate AMI Aptio UEFI MMTool, extracting the just inserted module as "uncompressed" and opening it with an Hex Editor. Before you are going to flash the new BIOS, you should make a complete backup of your entire system and boot partitions or at least of all important data. After having done that, enter the BIOS and list all your special settings. Before you leave the BIOS, choose and save the DEFAULT settings. Since the BIOS file name usually is layed down by the mainboard manufacturer within the BIOS itself, the "modded" BIOS file should not be renamed unless the new name is "in the line" with BIOS files, which were previously released by the manufacturer. Users with an ASUS or ASRock mainboard should look into the start post of >this< thread before they try to get a modded BIOS flashed. Otherwise they may get a failure message. After having flashed the new BIOS, you have to redo your previous BIOS settings. After flash is complete, shut down fully and switch off PSU, wait one minute and clear CMOS. Then turn on, boot to BIOS, load optimized, set the SATA Controller to the appropriate mode (AHCI/RAID) and save/apply/reboot back to the BIOS. Once in the BIOS again recover the previous boot settings (boot device and HDD boot order). If you have updated the Marvell 91xx AHCI/RAID ROM module, set the Marvell Firmware mode to "Force", then save/apply/reboot and let it load through to windows, before that happens Marvell Firmware will update and board will reboot. Before you restart with your usual PC work, you should verify the full function of the updated PCI ROM module. If you have inserted a new RAID ROM version into the BIOS, you have to make sure, that the "RAID" mode of the on-board SATA Controller is enabled, and then you should run the RAID Configuration Utility by hitting CTRL+I, F10 or similar (look into your mainboard manual). Everything will be fine, if you can enter and use the RAID Configuration Utility without any problem (Don't modify anything, if you don't want it to be changed!). Users, who are running their SATA Controllers in AHCI or IDE mode, should check the function of the freshly updated RAID ROM module the same way. After having temporarily enabled the "RAID" mode of the on-board SATA Controller they should run the RAID Configuration Utility and look, if everything seems to be fine (but don't create a RAID array!). Then they can close the Utility and reset the SATA Controller to the usual setting (AHCI/IDE mode). The data of their AHCI/IDE system will not be altered or destroyed by this procedure. Any feedback is much appreciated. Most important is a short report about the success or failure of flashing the "modded" BIOS into the BIOS chip of your mainboard. Don't forget to mention the vendor and the name of your mainboard and the sort and version of the flashed PCI ROM module. Hit the "Browse" button and navigate to the OROM file you want to insert. Check the "For Option ROM only" section. Since I have tested this procedure successfully with my ASUS P8Z68-V system, I can confirm, that the procedure is safe and maybe good for your system as well. Nevertheless there is no guarantee, that you will get benefit from the inserted AMD AHCI ROM module. But this cause anything error? No, the worst case would be, that you do not realize any change regarding the boot time and the performance. AMI Aptio V, nothing you can do for now. As plutomaniac already has written, this BIOS has a new AMI Aptio v5 structure and cannot be opened and modified by the AMI Aptio MMTool v4.50.0.23. Nevertheless it is possible to open the BIOS and to replace certain Option ROM or EFI modules by using CodeRush's UEFI Tool. The link is attached. To edit the bios and change where a few options are placed, in my asus z87-ws the fan controls are very badly placed in the bios menus layout, or modify the minimals setings .... if i reset the bios. Welcome at Win-RAID Forum and thanks for your report. Enjoy your system with updated BIOS modules! Just a bit earlier i have succesfully used UBU on my Asus Crosshair Formula Z, but i noticed that the Sata module was not updated. It thought that was a flaw or something,but it was really not there in the CSMcore...i verified it by searching in a hex-editor. Decided to take the plunge and went for it...success! When turning on my machine, immediately there's a POST message of the inserted module... and this procedure shaved 5-7 seconds off of the boot time! When the Windows 7 startup screen initiates,13 seconds later i'm on desktop...amazing! Fernando,is this the best approach? Could or should the current Sata module be replaced instead of adding the replacement this way? You are right. There is no AMD AHCI ROM module within the CSMCORE file of the latest BIOS 2101. So it seems, that it is an EFI SATA Driver module and will only be used, if you are going to boot a device in UEFI mode. That is an amazing result. You obviously were lucky with your experiment. I doubt, that it was the best possible solution for your system, because you may not be able to boot into your AHCI system, if you try to install any OS in UEFI mode. If I were you, I would open the original BIOS 2101 with the AMI Aptio MMTool and manually insert the AMD AHCI ROM module v3.2.2.0 into the CSMCORE file of the original BIOS 2101. Save the modification by hitting the "Save Image" button. Load the just saved BIOS image again with the AMI Aptio MMTool, choose the "Extract" tab, highlight the "CSMCORE" file and check the "Link present" button within the "For Option ROM only" area. Then choose the 1002,4391 from the list, enter any file name like "extracted_ROM.bin" into the "Module file" box and hit the "Extract" button. At least you can compare the extracted AMD AHCI ROM module with the original one. They should be identical. After having done all that, you can flash the modified BIOS and look, if you will get the same success as with your earlier method. Thanks for this great explanation Fernando, this is exactly what i did... I followed the advice you gave to Piloss, i did NOT just replace the AC/SataController/510DF6A1 module. Well, i did not extract and verify my own insertion though...indeed highly recommendable for BIOS editing. *slap myself* ... i felt kind of safe because of the ROG usb-flashback-method,and i already had a backup chip. I do still wonder what happens if i set the compatibility mode for the bootup drive to legacy or UEFI. When, and if it would use the default module,the EFI module,or if it would now always use my inserted module no matter what i tell it to do. The POST message of the new module only shows for about 1 or 0,5 second when doing a cold boot. When doing a reboot/warm boot, the POST message could only show 0,1 second, but most of the times it is loaded so fast that you won't even see it! Because it doesn't always show, i thought for a moment that the modding result was erratic... I was wrong about that, result is stable and all is good! As long as you are booting in LEGACY mode, the ROM modules of the CSMCORE file will be loaded, but I do not exactly know, which ones of the EFI modules will be loaded, if you should try to boot in UEFI mode.